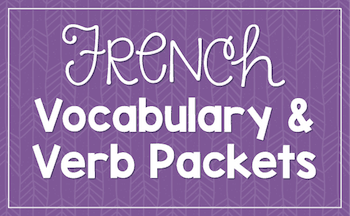 Yes, you can make it fun to learn French verbs! 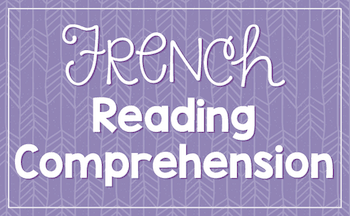 Often, when I tell people I’m a French teacher, they tell me that they took French in high school and they had a hard time with all those FRENCH VERBS! 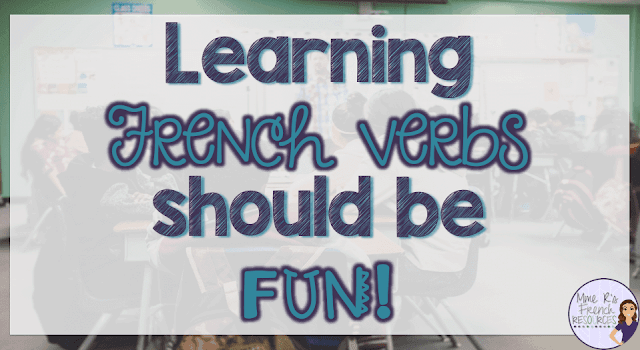 Yes, there are a lot of verbs to learn, and then a lot of tenses on top of all that, but teaching verbs doesn’t have to be so boring! Here are some of my favorite ways to teach verbs to beginners. Students learn best when the activities are meaningful. Nothing is more ineffective than giving students a vocabulary list, having them repeat 30 words after you, and then writing them down a bunch of times. They just don’t learn that way! 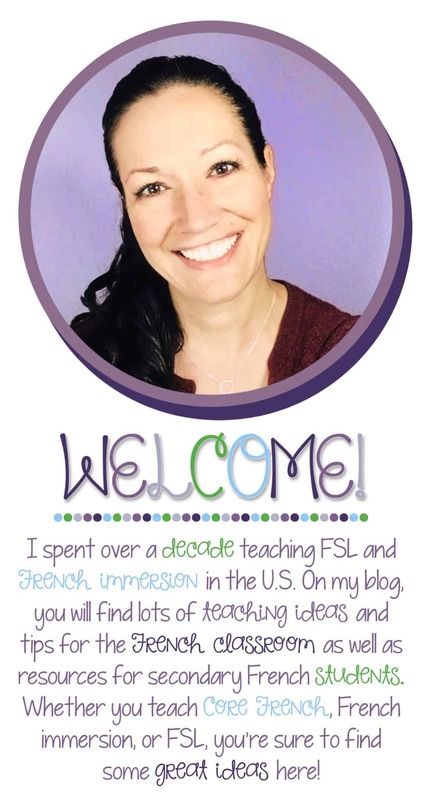 Now, if you’re familiar with my style of teaching, you’ll already know that I don’t like translation as a way to learn vocabulary. A few sentences here and there can be really helpful, and sure, students can memorize a list, but the more contextualized words are, the more likely they are to remember them the next day or the next month. To introduce vocabulary, I show images of the words on the list. I might use a word wall, a PowerPoint show, or funny pictures I’ve found on the internet. Then I provide students with a vocabulary list, and I have them read the words aloud for a few minutes with a partner. I always start my year with a lot of phonemic awareness, so by the time I’m teaching verbs, students are able to read infinitives with little to no help from me. After a few minutes, I ask for volunteers (the brave students who love to get up!) to act out some of the words. By this time, students have heard the words from me, and they’ve associated them with images. They’ve read the words and said them out loud, and they’ve acted them out (or watched someone else act them out). They have already had five different types of practice with the list, and it’s only been about 10 minutes! 2. Make verb drills fun. Yes, verb drills have a time and place in class! 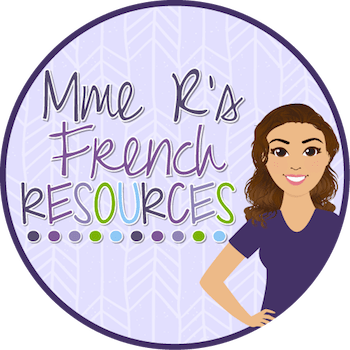 They aren’t something you’ll want to do everyday, but to help students quickly recall those French verb endings, drills can be really effective. A bit of memorization just makes things easier when you get to the more complicated stuff. For example, all those spellings words I learned as a grade-schooler make it easy for me to write now. The times tables I memorized in math (and I HATE math) made math homework quicker. Think of the drills as something quick, fun, and effective to do once in a while. 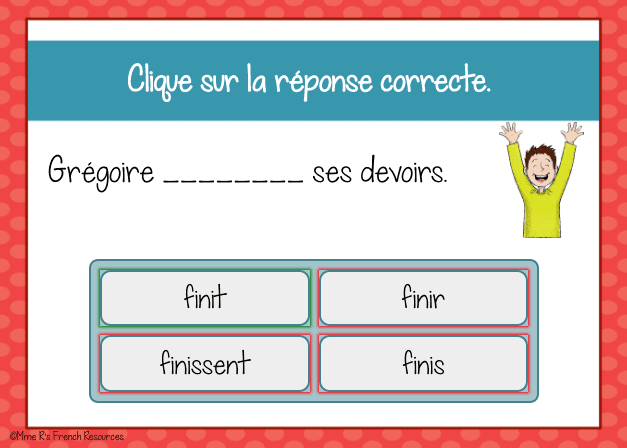 You can do them as written drills like this activity for -re verbs. Or you can do them as oral drills like this fun French verb dice activity here. 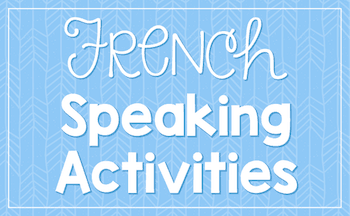 Find these French verb drills plus fun speaking and writing activities here. 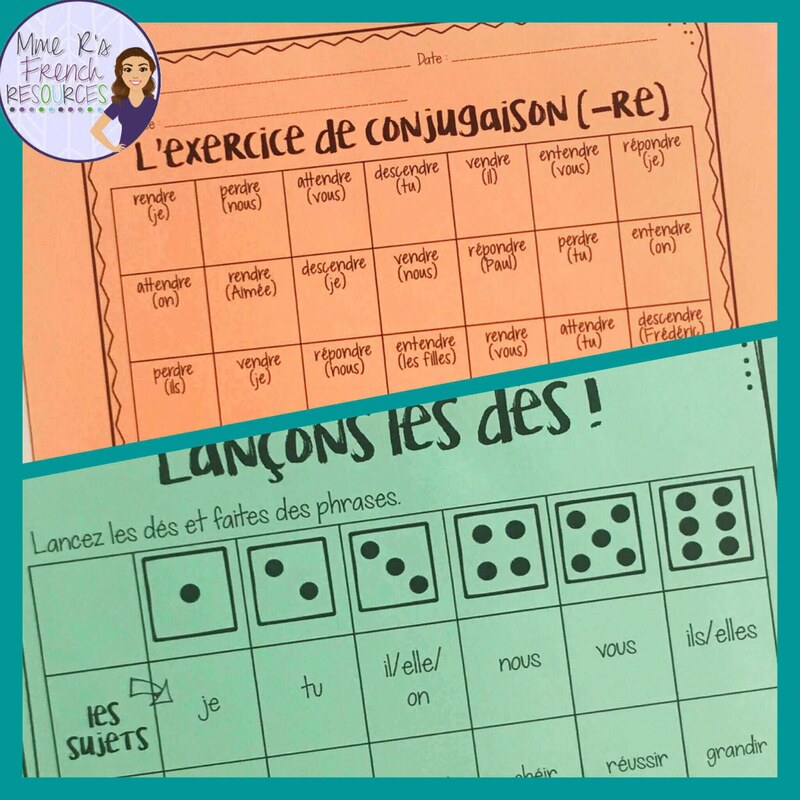 Digital task cards are an amazing way to let students practice their French verb conjugations, because let’s face it, students love their screens! Boom Cards™ are visually stimulating and because they are self-checking, students know exactly what they need to study. Use them for whole play in class, assign a set as homework, or let students who finish quickly work on a device while others are finishing a task. 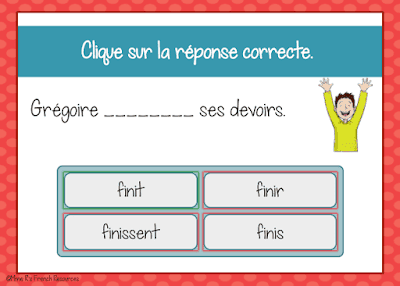 Click here to see these -ir verb cards from Boom Learning℠. *Boom Learning and Boom Cards are the trademarks of Boom Learning Inc. Used with permission. 4. Play games in class. 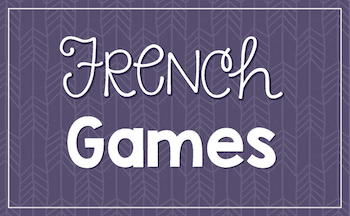 Yes, make those French verb drills a game! Use your whiteboard or use individual white-boards to have board races. Play board games. Let them have fun with verbs and they’ll see that it isn’t all just boring conjugation work. One of our favorite games that will let students move around a lot is Scoot! Click here to learn how it works. 5. Provide ample opportunities to speak. The real key to language acquisition and retention is speaking. Students aren’t taking French to spell verbs on a paper. They want to talk, and they need a lot of practice in order to be comfortable doing so. Speaking cards like these provide students with a non-threatening activity that can be structured many different ways, so even the most reluctant speakers will take the risk to speak. Each set of cards includes six different ideas for using them, so it’s easy to always keep it new and exciting, even if you frequently use speaking cards. Find these speaking cards here. 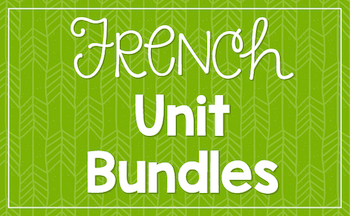 These -ir and -re resources are available in THIS BUNDLE. 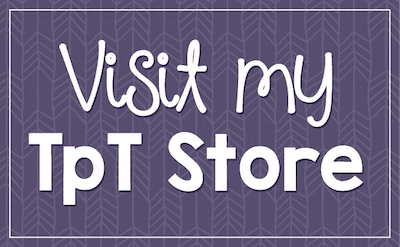 You can find all of my bundles HERE.